The AKC S.T.A.R. Puppy is an exciting program designed to get dog owners and their puppies off to a good start. The AKC S.T.A.R. Puppy Program is an incentive program for loving dog owners who have taken the time to take their puppies through a STAR Puppy class. The AKC S.T.A.R. Puppy test will be given on the 7th week of the STAR Puppy Class. Upon passing the test, all puppies less than 1 year old will get an application to send to AKC® for enrollment in the AKC S.T.A.R. Puppy Program. All puppies are welcome to participate in the AKC S.T.A.R. Puppy Program including purebreds and mixed breeds. 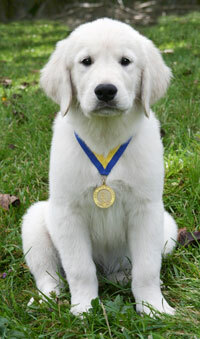 There is no additional cost for this test which we include at the end of the STAR Puppy Class. The Star Puppy test is $5 if you have not attended class at Walkers.